I’m so excited to share a few details from our new Dining Room project we’ve been working on. I truly believe the dining room is the room that you can REALLY have fun in and we sure did! We hired the talents of Kathryn Myrick (Interior Designer), Alison Seeger (Slipcovers) and Daisy Sullivant (Artist) to help our vision come to life. Kathryn is a dear friend (and branding client I might add!) and helps me push the envelope with choices throughout the house. Alison is uber talented and created those beautiful slipcovers. One set features our interlocking M monogram and the hostess chairs features Kelly Wearstler’s Imperial Trellis fabric (swoon!). Daisy completed the room with her amazing talent – those walls! Could you just die over these! Everytime I walk in the dining room, it takes my breath away and I’m amazed at how it turned out! 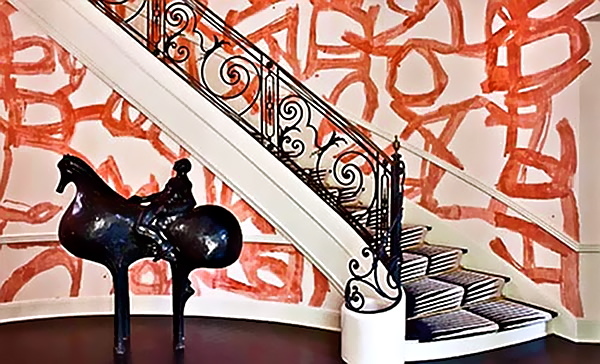 Daisy used to work for Kelly Wearstler and was super familiar with her hand-painted foyer project (see here). I just LOVE this and was inspired to recreate this in the dining room. I’m a huge fan of accent walls so Daisy painted the orange accent wall and finished out the room in cream/gold paint strokes. It is SO beautiful in person – especially when the light catches the gold. Stunning. We are working on Daisy’s fancy new website, but until then, email us [email protected] if you want her information – she is available for commissions and consulting for fabric, pattern and texture design. She has quite a few amazing projects up her sleeve! The dining room table is a family piece from my husband’s parents and the china cabinet was one of the first pieces we purchased after we were married. The bamboo chandelier is from www.ShadesofLight.com and the Bar Cart is compliments of Johnson Vann Interiors and Worlds Away. And last but not least, bar accessories available in The Shoppe. Hope you enjoy and happy entertaining! Ohhh I love that gold paint strokes wall! So fabulous! Hi Betsy! Yes, I actually purchased it at Homegoods!